Offal are the organs (such as the liver, lungs, heart, kidney and sweetbread) of an animal that are used for food. Most people don’t eat offal but we Greeks love them and cook them in many ways (see links at the end of the post), our most popular recipe being Kokoretsi. Once, I was sort of cursed by someone who loves goats, when I wrote the recipe Fried Goat Liver with Whiskey and herbs but what someone eats is a matter of culture and who are they to tell me what to eat and what not to eat? If they are vegan, the may as well substitute the livers with pleurotus (oyster mushrooms), which have a meaty texture and let us eat what we like! You can make this recipe with lamb or goat offal. During Easter when we usually buy a whole lamb to make it on the spit, it is sold together with the organs. 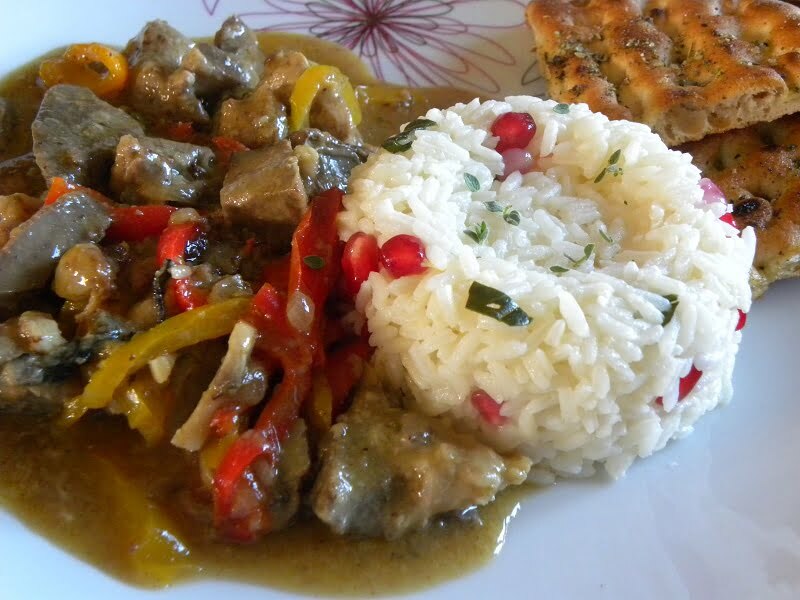 If we do not make kokoretsi or magiritsa, this is the best recipe to use the offal. Other times, whenever I make it during the year, other than Easter, I prefer to use goat offal, as lamb has more fat that a goat. If you don’t like goat or lamb liver, like my daughter, you can also make the same dish with chicken giblets, which she likes very much. I must say they are not my favourite because they tend to be much drier and less tasty but still they are a good alternative. I usually make this dish with finely chopped onions but the last time I made it, we had removed the onions and garlic from our garden, which were very small, so I used them whole. We even found three very small potatoes, which my husband had planted, so I also added them whole with the skin on. However, I wouldn’t add potatoes to this dish, although they were delicious as they sucked up all the flavour, as I usually serve it with white or brown rice pilaf. However, if you won’t serve it with rice pilaf, you can add some baby potatoes or serve it with Patates Tiganites (fried potatoes). Wash the offal and cut them into small pieces and let them drain. Alternatively, you can use chicken giblets). Heat 2 tbsp olive oil in a non-stick frying pan or wok and sauté the onions until translucent. (You may also use whole baby onions). Add the garlic and mix for a few seconds. Remove to a plate. Add the other tbsp olive oil. Sprinkle the flour on the livers and mix. Add them in the frying pan and sauté until they change colour from pink to white. Add the celery, peppers, bay leaf, salt, pepper, oregano, rosemary and mix. Add the wine and cook for a few minutes for the alcohol to evaporate, then add the lemon juice. Cover with the lid, lower heat and simmer for about 45 minutes, mixing regularly until the liquid is reduced. When cooked mix in the butter and turn off the heat. I also served it with a Salad and some Crispy Greek Pita Chips. I hope you will give it a try and hopefully to turn any liver haters into liver lovers. Place tomatoes, peppers, olives, capers and basil in a bowl. Season with salt pepper and oregano. Crumble feta, add the olive oil and vinegar and mix. When I was much younger, I did eat offal, but mostly chicken and pork. This looks like a hearty and delicious dish, Ivy. Thank you Angie. Glad to see that you like offal. What a scrumptious looking dish! I love offal and I wonder how goat livers taste (surely great!). Thank you Rosa. Since you love offal you will love this dish. This is very nice dish.from this i will prepared in my homes.Place tomatoes, peppers, olives, capers and basil in a bowl. Season with salt pepper and oregano. Crumble feta, add the olive oil and vinegar and mix. Wow it looks so yummy and mouth watering…Love your presentation….